Modern Kuwait is a small constitutional monarchy that lies on the north-western shore of the Persian Gulf. It owes much of its wealth to rich deposits of oil beneath its very mixed terrain. Its capital, Kuwait City, lies in Kuwait Bay which overlooks the Persian Gulf. The land here and closer to the Tigris river basin in the north is fertile, but this decreases towards the western side of the country, becoming desert before the border is reached. Kuwait is neighboured by Saudi Arabia to the south and Iraq to the north, and by Iran across the waters of the Persian Gulf. The north-eastern section of the Arabian peninsula was seized by the Ottomans in the seventeenth century from the previously dominant Safavid shahs of Iran. It wasn't until the following century that settlers first arrived at the site of the present-day capital from Arabia's interior, but their settlement grew into a busy trading hub within a century, probably helped by the British-enforced peace in the waters of the Persian Gulf. In the mid-nineteenth century Britain was becoming a major force in the Gulf, and the Kuwaitis saw this as a way of avoiding potential direct rule from Turkey. In 1899 Sheikh Mubarak 'the Great' struck a deal with Britain and became a protectorate on 23 January 1899 in return for allowing Britain control of its foreign affairs. The country's name in Arabic is Daulat al-Kuwait, meaning 'little fort'. Its ruling family descend from the Bani Utbah federation of clans. These clans are thought to have migrated from Najd in the centre of modern Saudi Arabia to the Persian Gulf in the sixteenth century, and of these the al-Sabah family gained control of Kuwait in 1756, governing it with a level of independence under the overlordship of the Ottomans. 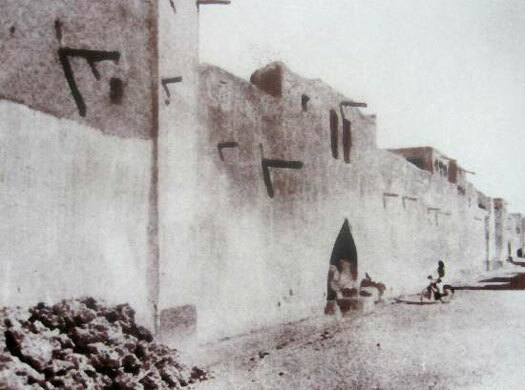 The related Khalifa branch gained control of nearby Bahrain in 1783. Kuwait's oilfields were first tapped in the 1930s, and since independence oil has made up around 90% of its expert revenues. Son of Sabah. Oversaw transition to British protectorate. Mubarak is the seventh ruler of Kuwait following the arrival in the region of the al-Sabah family in 1756. He gains power following the controversial death of his brother, Muhammad. Mubarak is implicated in that assassination, but the details are extremely unclear and vary wildly. In 1899 he agrees the Anglo-Kuwaiti Treaty with the British government that hands power over foreign affairs to them in return for security and protection. Thanks to this deal, which is very beneficial to both parties, Mubarak is viewed as the founder of the modern state of Kuwait. Brother. Former governor of Kuwait City. Son of Jabar. Founded Kuwait's military and public security force. Kuwait holds its first modern elections, making it one of the first Arab states in the Persian Gulf region to have an elected parliament. Much of Kuwait's modern infrastructure is created during this period. Large oil reserves are discovered in Kuwait by the US-British Kuwait Oil Company. Exploitation is delayed by the Second World War, but thereafter it fuels the country's development into a modern commercial centre. Son of Salim. Became emir in 1961. Died following a heart attack. A major public works programme begins in the state. Thanks to this, Kuwait's infrastructure is transformed, bringing it fully into the twentieth century and granting its residents a high standard of living. Bahrain declares independence on 15 August and signs a new treaty of friendship with Britain. Sheikh Isa becomes the island's first emir and the Council of State becomes a cabinet. On 16 December, Bahrain gains formal independence from Britain. Son of Ahmad. Died 15 Jan aged mid-70s after 5 years of ill health. Saddam Hussein of Iraq claims that the new revolutionary government of Iran is attempting to topple him from power. He declares war and the border between the two countries is a permanent battlefield for nearly a decade. Iraq is supported strategically and financially by Kuwait. Hussein occasionally employs chemical weapons on his enemy, but the two sides are evenly matched and the war ends in stalemate. In July 1990, Iraq complains to Opec, accusing Kuwait of stealing its oil from a field near the border. Military action is threatened. The First Gulf War is triggered when Kuwait is subsequently occupied by Iraq. 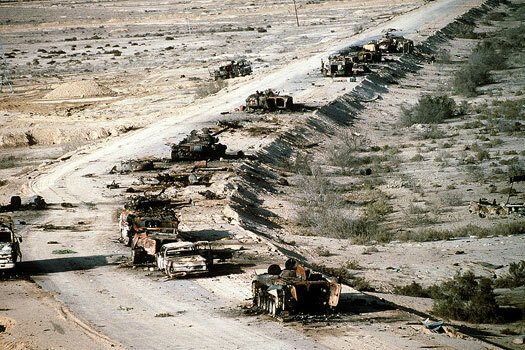 A United Nations coalition army under the control of the USA is assembled in Saudi Arabia in 1991, and it causes the Iraqis heavy losses while they are being forced out. Kuwait's infrastructure is left in poor shape and has to be rebuilt. Oil exports stop for a time. The UN demarcates a new Kuwait-Iraq border, awarding a port and a number of oil wells to Kuwait. US troops are despatched to Kuwait following Iraqi border incursions. The following year, Iraq officially recognises Kuwait's independence and the UN-demarcated borders following UN pressure and Russian mediation. An Anglo-American-led Second Gulf War leads to the collapse of Iraq's regime after just twenty-one days of fighting. Prior to the invasion, Kuwait serves as a base for a massive presence of mainly US and UK troops. A democratically-elected Iraqi government takes control of the country within two years in 2005, ending the Allied administration of the country. Moves to change Kuwait's male-dominated political structure culminate in the granting of full political rights to women. In May of the same year, parliament gives women the right to vote and stand as candidates in elections for the fifty-seat National Assembly. Distant cousin. Health poor, replaced by parliament after 10 days. The growing assertiveness of parliament has led to frequent confrontations with the government, especially after Islamists make major gains at elections in February 2012. The annulment of those elections and subsequent changes to the election law prompt an opposition boycott of fresh polls in December, putting Kuwait's relatively liberal political credentials in doubt. Despite large oil revenues, the economy has also been badly affected by the global financial crisis. Economic policy-making has been held back by disputes between the ruling royal family and parliament.